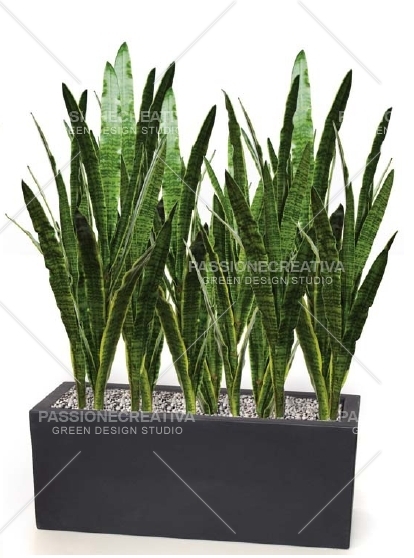 The indicated price refers to the measure of the flower arrangement 1 meter lenght fence ALL IN ONE (h 130) with pot 100x40 h 40 cm and artificial Sanseveria trifasciata green/yellow colour h 90 cm. Finishes and characteristics of the materials: resin vase, high quality flowers and plants used make the composition very similar to the real. Ideal for inside environments. Vase colour in composition: black pearl (look photo). Shipment goods: within 24/48 hours. QUALITY AND CONSTRUCTION DETAILS LIKE TRUE: This line of artificial plants stands out for the highest level foliage, where possible mounted on natural trunks. The leaves, their attachment to the main trunk, are expertly assembled in MINIMUM DETAILS to reproduce the true natural plant best. The vegetation reproduces faithfully the shades of color, texture, consistency, veining and is made of durable and easily washable materials. << Often customers who see them live confuse and ask if they are true .... >>! VASE COMBINED WITH THE PLANT: we propose a ready-made compositional (ALL IN ONE) of rapid effect, if you are looking for other solutions we can help you select the most suitable complement. In the POTS or ARTIFICIAL PLANTS section you will find other items to combine to your liking according to your style. H COMPOSITION: always refers to the total height from the ground including the furnishing vase and the plant in it (see picture). CUSTOM-MADE PLANTS ON REQUEST: respect to the standards of artificial plants you see on the Website, remember that our strength is to build them according to your needs. Based on the available foliage and trunks in stock, we are able to create trees up to 12 meters high (FICUS, PALMS etc...), we can make color variations on the leaves, widen the canopy, decide what height the grafts to give more emphasis to the trunk or to the green part .... We are able to evade the most diverse requests for custom projects: if you have these requirements we invite you to contact us directly. CLEANING OF ARTIFICIAL PLANTS: we provide on request a specific antistatic product for cleaning the leaves. Gives it brilliance and protects it most of the time from dust storage. We provide specific maintenance for businesses and individuals who require it. ARTIFICIAL PLANTS/FLOWERS THAT PASSION: We recreate green settings/scenery where natural green would be difficult to develop and maintain ..... for lack of light or in general for an unsuitable microclimate. We propose to our customers (even the most suspicious ones) the use of these decorative solutions to replace real plants where continually the fallen leaves are to be cleaned, they see the leaves turn yellow, the dried branches must be cut ..... Those who choose these solutions will over time their management and maintenance costs. Ideal for public spaces, offices, SPA, hotels, companies, private homes ....... our taste, passion for the beautiful can change the face to a context !. Thanks to the suggestions of our GREEN DESIGNER we will help you to put the plants in the right place to decorate with style the spaces you want to give a touch of creative green. DELIVERY TIMES: normally we guarantee the shipment of artificial plants within 24/48 hours for goods ready for delivery, within one week for custom-made seminatural-plants all over the country. For specific supplies please contact us. RETURN OF GOODS: Passionecreativa e-commerce on the WEB since 2008 provides pre/post-sales support for all our affiliated customers in Italy and abroad. Any inconvenience, from shipment to delivery of goods through our couriers under contract, will be tackled and solved securing maximum customer satisfaction. You can contact us directly for any specifications you would like to receive. For almost ten years we have been providing a top-level service looking to cure every single detail by selecting the most efficient partners on the market. The constant search/selection of quality products around the world and the utmost attention to every single customer, has led to the fact that we have never had a returned item! SATISFIED OR REIMBURSED: we remind you, however that if you do not like the product you purchased at the time of reception, you have the option to return it in the times and in the procedures described in the RETURN POLICY. For any specific request, please do not hesitate to contact us at our CUSTOMER CARE +39 3805191197.